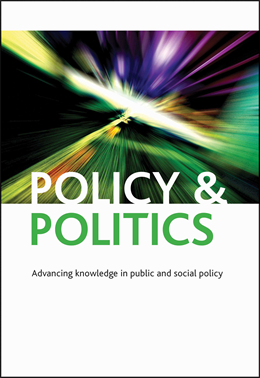 We are delighted to announce that Policy & Politics , which has been publishing key works in public and social policy and politics for 45 years, has just achieved an impact factor of 1.939. It is now ranked 11th in the field of public administration, placing it firmly in the top quartile of international journals. Policy & Politics, published by Policy Press, has gained a reputation for being more innovative and risk-taking than many of its competitors, partly due to its clear competitive advantage of being owned by the University of Bristol and therefore wholly independent. “This impressive rise in the impact factor is a testimony to all the hard work of the Policy & Politics Editors and a highly successful collaboration,” Publisher Julia Mortimer (Policy Press/Bristol University Press) commented. Sarah Ayres (School for Policy Studies, University of Bristol), Co-Editor, said “Through an explicit aspiration to promote scientific excellence in the field, we are determined to hold on to our position of valuing alternative approaches to the mainstream: embracing plurality and innovative articles that seek to do something different. We congratulate all of our authors who have contributed to the Journal’s success”. Alex Marsh (Chair, Policy & Politics Editorial Board), Sarah Ayres, Felicity Matthews, Steve Martin (Co-Editors, Policy & Politics), Julia Mortimer (Publisher, Policy Press).